I read it once that “Faces and Bases make minis look Aces”. I believe this is certainly true. A decent base can ground the model and give it that finished polish. The eye is naturally drawn to a model’s head and anything off there is the first thing noticed…and it’s easy to go wrong. Luckily for me then, I have a long history of favoring characters with covered faces. 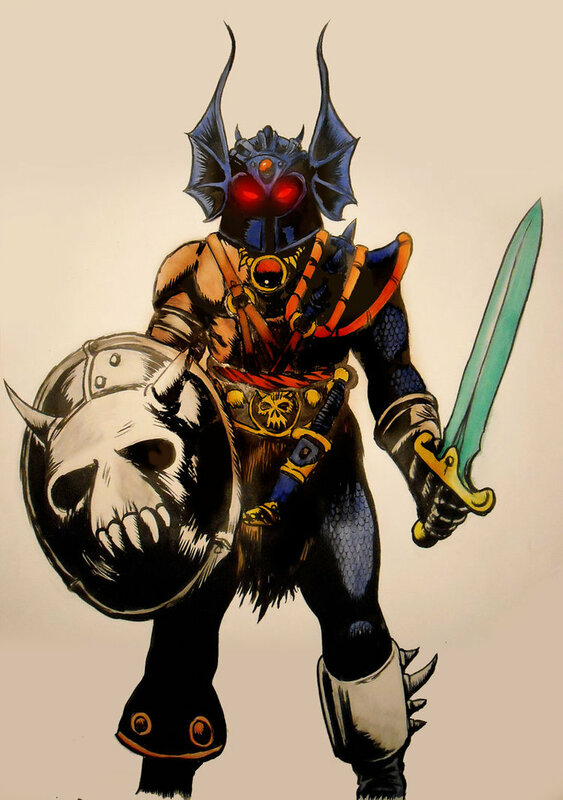 Going back to my childhood, my imagination was first captured by the likes of Warduke from Dungeons & Dragons and Darkwolf from the Ralph Bakshi animated feature Fire & Ice. 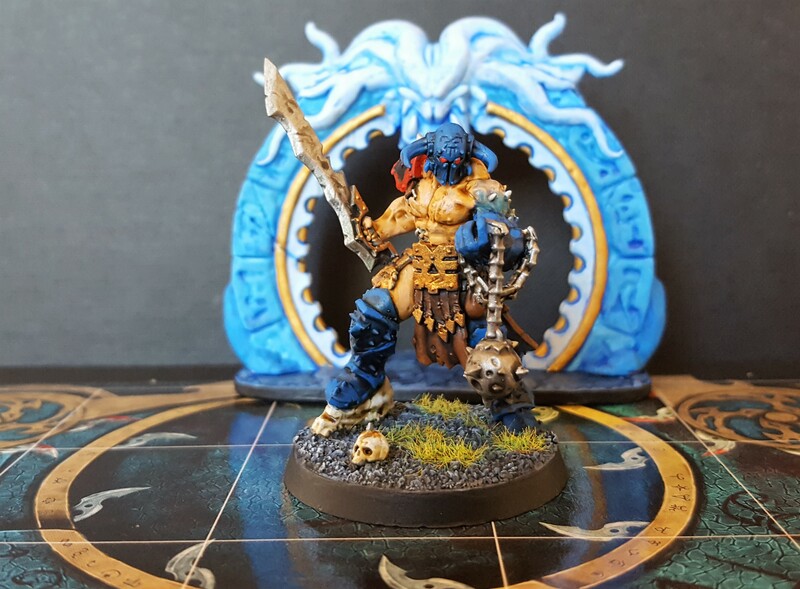 I’ve even painted up a little ‘Warduke goes Age of Sigmar’ model in homage to the character. In the realm of science fiction, I spent hours outdoors pretending to be Inframan. In high school and college, I took up wrestling having been inspired by Mexico’s luchadors. To this day, my wife shakes her head as I still watch the masked heroes of the squared circle during my late night painting sessions. It a straight up guilty pleasure. These covered heroes manifest themselves in my hobby inspiration by guiding me toward factions and characters that have covered faces when possible. I’m not the best painter, so even my best intentions can have a model looking…well, a bit special to put it one way. On top of that, I’m coaching my son into his first foray into painting and the last thing he needs is to be discouraged by not being able to get the eyes or mouth looking right. Fortunately, he picked up on this concept right away and favors Stormcast Eternals and any without a helmet…he puts a helmet on. As we’ve worked through our Age of Sigmar started box, we’ve included as many helmeted heads as possible even sourcing some from outside that initial box. 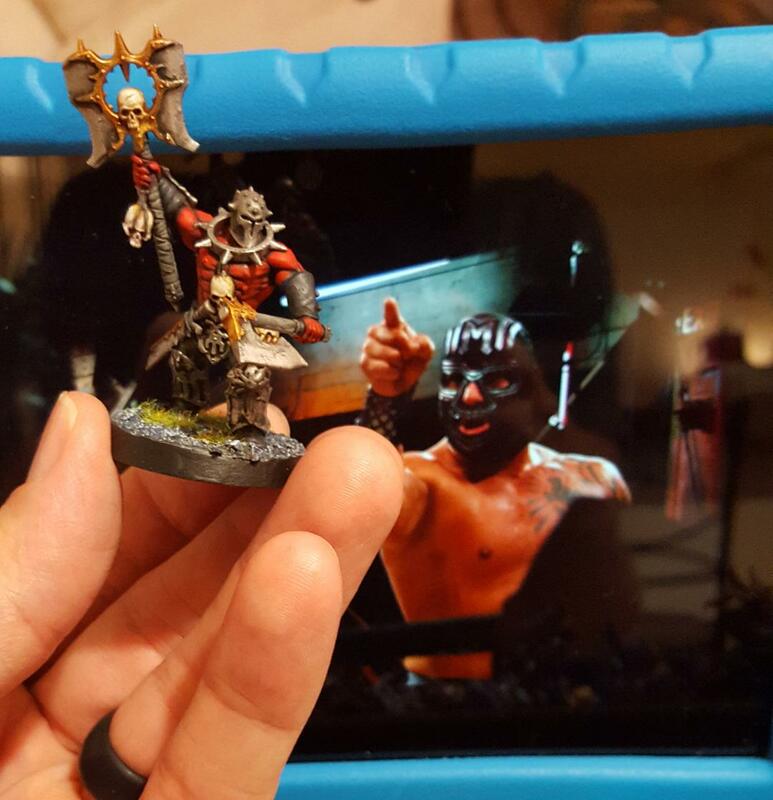 Below is one of my ‘Bloodskins of the Iron Keep’ (which I’ll feature when complete) and we can see Mil Muertes agrees that a model is well-dressed when in a hood. What does all this have to do with Games Workshop’s new title Warhammer Underworlds: Shadespire? 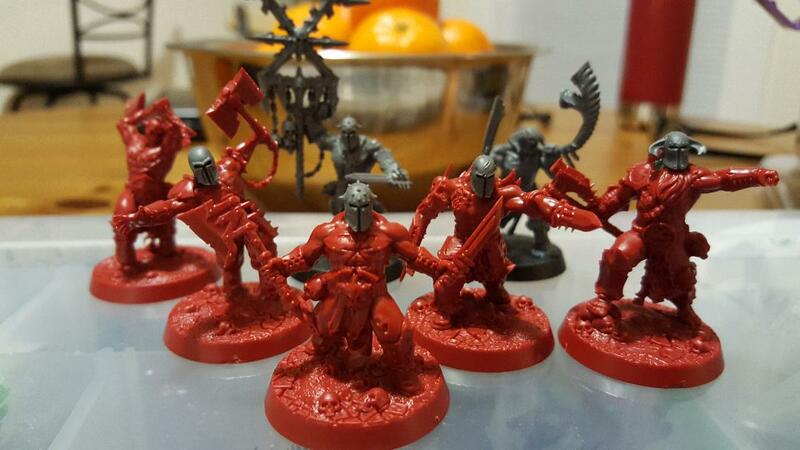 Well, we couldn’t leave the base game’s warbands alone…too many exposed heads waiting to be googly-eyed by our brushes. So, we have converted them to be fully helmeted! 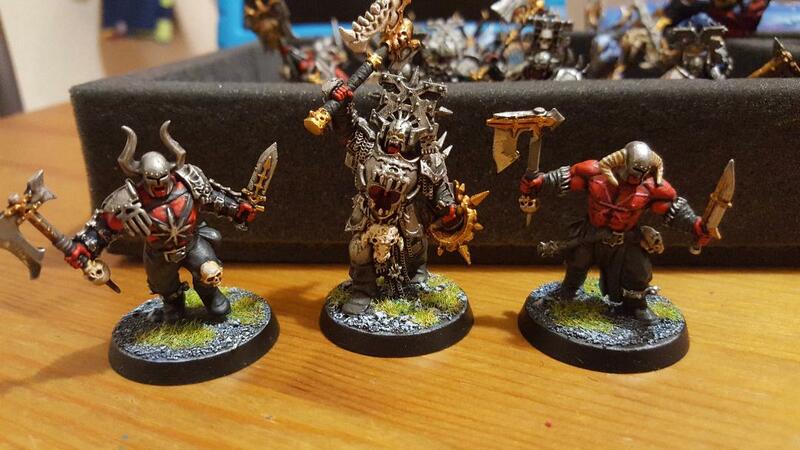 How about a shot with their leader the Darkoath Chieftain in front? 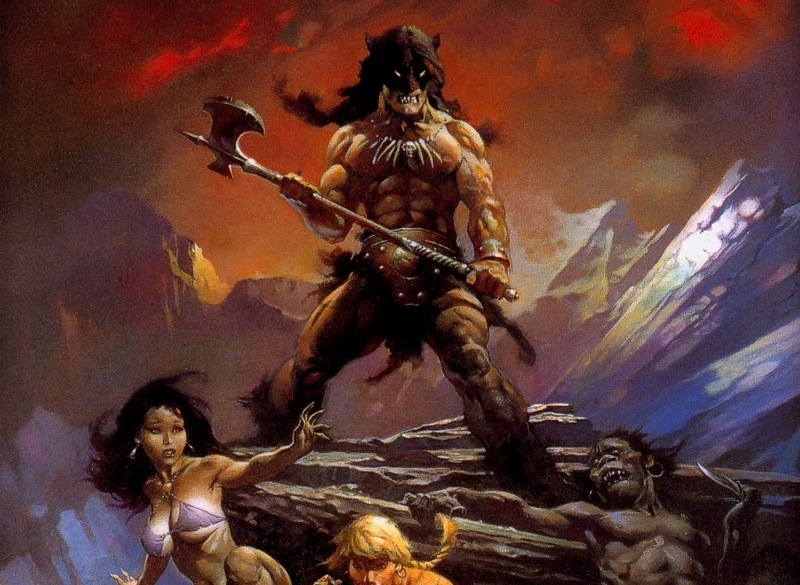 Note: I really like that name ‘Darkoath’. I wish it wasn’t a faction as I just might use it as the character’s name. A much appreciated nod to Fire & Ice’s Darkwolf. 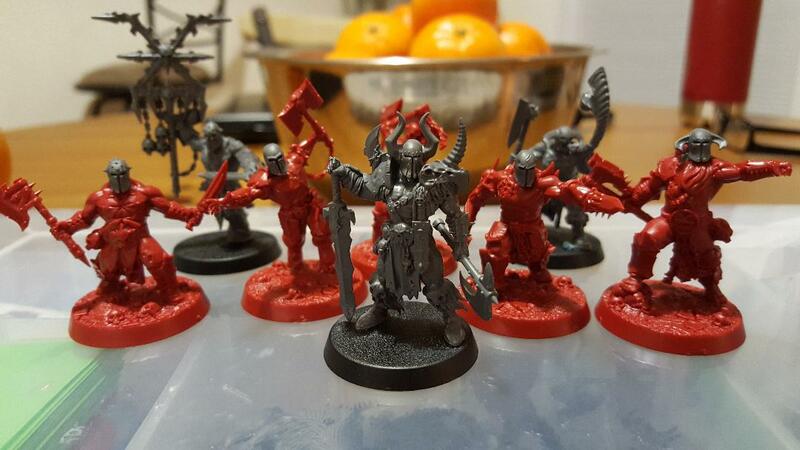 With a little help, my son has made his first conversions. Now Steelheart is a helmeted champion able to double as a Knight Questor in AoS. 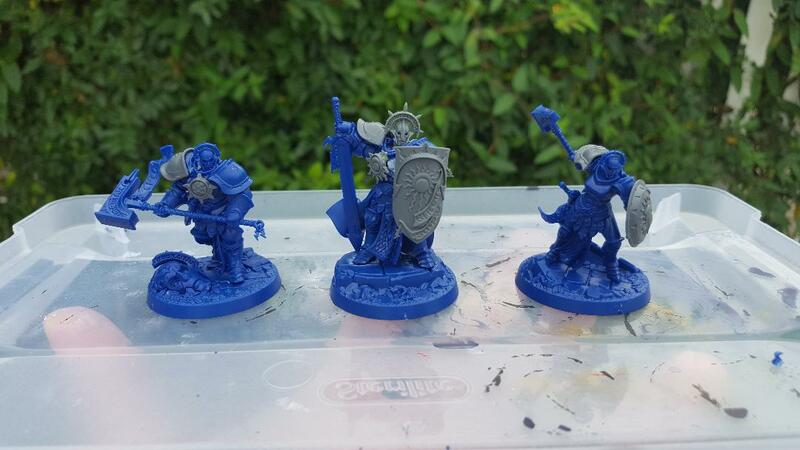 We’re very pleased with these easy conversions and painting the next week or two will be a pleasure. As with most GW titles…we’ve had a lot of fun with Shadespire already…and have yet to play a game! 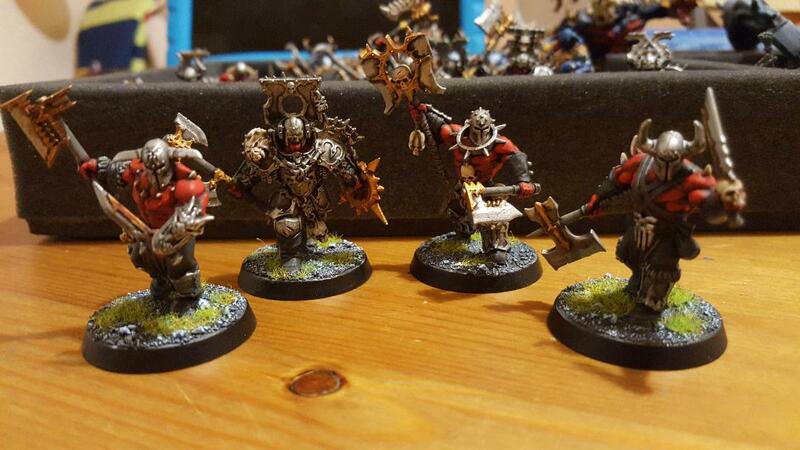 This entry was posted in Age of Sigmar, Gaming, Hobby Tips, Shadespire, Warhammer Quest, Warhammer Underworlds and tagged Age of Sigmar, Games Workshop, Miniatures, Shadespire, Silver Tower, table-top games, Warhammer Quest, Warhammer Underworlds by Mr. White. Bookmark the permalink. Thanks, Mike! I’m looking forward to seeing your face brushwork on the new Necromunda models. I think you’re gonna like the new scale.